On October 5, the first volume of a comic called Head Lopper will be released. If you missed its 2015-16 run, and have any interest whatsoever in cool and interesting things, I suggest you check it out. Set in a fantasy world, the comic is about a big ol’ swordsman nicknamed Head Lopper, who carries around a witch’s head in a bag and arrives in a town for some contract murder work. Things go sour from there, and in a shocking turn of events for a guy who makes a living killing things with his sword, much fighting ensues, mostly against horrible monsters. 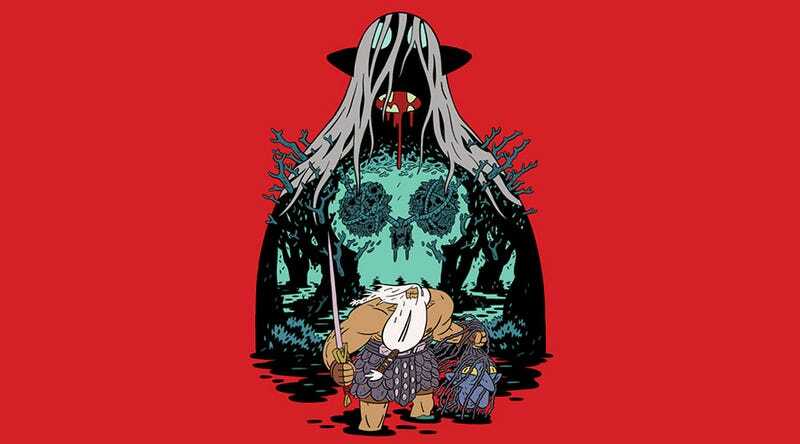 There are two things that make Head Lopper—the work of Andrew MacLean, who both wrote and illustrated—so damn good. The first is the vibe of the fantasy world. It’s very Hellboy, dripping with arcane mysteries and a dry wit you rarely see pulled off this successfully. This doesn’t feel like some overblown fantasy epic, all sweeping landscapes and convoluted backstories. The camera is kept very close, and all you’re really worrying about are how Head Lopper is getting out of the next jam, and how many laughs you’re going to get out of it while he does it. The art is also incredible. Again, there are Hellboy influences here, in both the colour work and monster design, but it would be unfair to say this is just a Mike Mignola tribute. Head Lopper has its own bright, bold style that made for some of the best covers of 2016, and makes me wish someone would front the cash to turn this into a cartoon series. Oh, and the way MacLean repeatedly draws Head Lopper’s face as just a beard on a head (below) is the best. Sick sword move, Head Lopper. It’s also wonderfully dynamic. Fight scenes can often be a bit of a mess in a comic book, but MacLean’s neat ideas on sketching out Head Lopper’s leaps and slashes (like those above) are worth being framed as posters in their own right. At four issues it’s a short, funny ride through a story that involves a beard carrying a sword cutting a lot of heads off in creative and good-looking ways. If that’s enough to recommend a comic for, then...look, I just don’t know what else you’re looking for in the world.